The ability to manage up to 6 machines from a single payment box makes the MyService an ideal solution for small to medium self-service laundries. 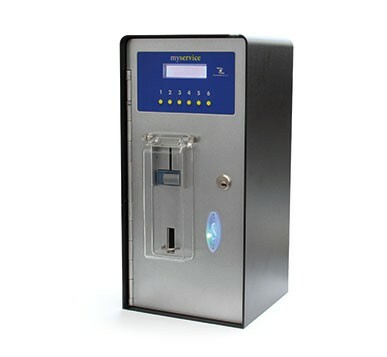 Fitted with both a coin/token slot and reader that is able to accept pre-paid cards and key tags it can solve many of the problems associated with existing coin operated systems. Incorporating ‘Eurokey Next’ technology, the card and key tag activation method allows for management of how often a user can activate machines during a given period, what time they can gain access thereby easing waiting time in communal laundries or allow for cheaper payments during less popular time slots. This is an extremely flexible, cost effective and space saving payment system, call us to find out how it can help your laundry run more smoothly.